We’re pleased and proud to announce that the fifth, long-awaited installment of our ongoing, history-making signature series, ‘SLOB’, is now available. 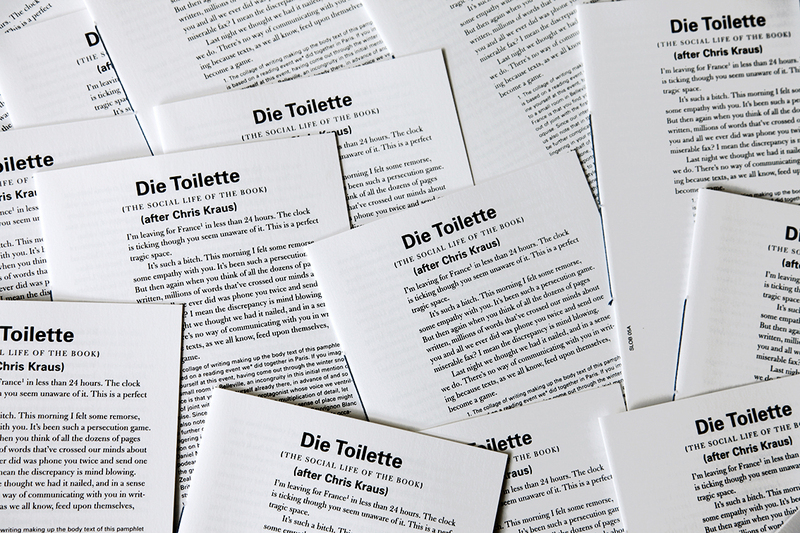 Die Toilette is an assemblage of text fragments taken from different books by LA-based writer Chris Kraus, conceived and annotated by artists and writers Jon Bywater, Louise Menzies and Marnie Slater. By reading through Kraus’s texts looking for traces of New Zealand, where she grew up, the three Kiwis question the representation of the distant; how it is embodied by characters, situations, language, and in the writing/reading dynamics Kraus creates. The beach, affection and love relationships, the role of the city, intense relations with wildlife – all this and more is at stake in this amazing cut-up. The Social Life of the Book is a collaboration between castillo/corrales, the EBABX – School of Higher Education in the Arts of Bordeaux (F), the Gerrit Rietveld Academie (NL), Amsterdam, San Serriffe, Amsterdam (NL), with the support of the Centre national des arts plastiques (aide à l’édition), ministère de la Culture et de la Communication (F).